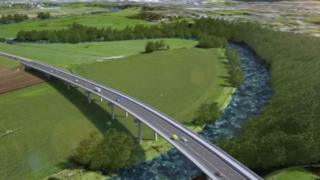 A new bypass will generate jobs and economic growth, an MP said. The Department of Transport has agreed to give £54m towards the construction of Shrewsbury's north-west relief road, with work expected to start in 2022. Shropshire Council said the "much needed" road will reduce traffic, accidents and carbon emissions in the town. But environmental groups said it will disturb wildlife. Shrewsbury and Atcham MP Daniel Kawczynski said: "Not only will the road unlock large amounts of economic growth for the county bringing with it jobs, it will also improve congestion both in small villages and the town centre." The road, between the Battlefield Link Road and Oxon Link Road, will also include two bridges and crossings for cyclists and pedestrians. The full cost of the road is estimated at £71m, with the council to provide any remaining funds. Steve Davenport, cabinet member for highways and transport, said: "The North West Relief Road will benefit not just Shrewsbury but the whole of Shropshire and, though there is some way to go before the road is built and in use, securing this funding from the government is a huge step towards making this much-needed road a reality." Before work begins, a full planning application will be submitted to the authority and it is expected that construction will take five years. Shropshire Wildlife Trust had said the scheme had "guaranteed enormous environmental costs".